Eng. Mustafa Sanalla, chairman of National Oil Corporation (NOC), held a meeting with Dr Ali Dhib, chairman of the management committee of the Petroleum Training and Qualifying Institute (PTQI) at NOC Tripoli headquarters, on Sunday, March 24, to review the Institute’s annual priorities and training programmes. 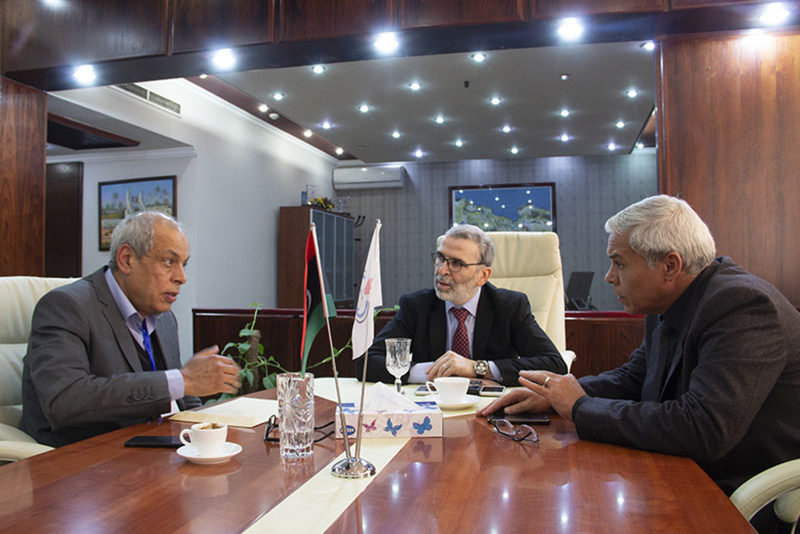 Dr Dhib briefed the NOC Chairman on the status of NOC-sponsored project implementation, including industry-level upgrades to lab equipment, the introduction of professional simulations to training courses, as well as support for the Institute’s overall infrastructure, including improvements to the canteen and stadium. NOC chairman commended the PTQI for its exceptionally high level of educational achievement, pledging the corporation’s continued support for the Institute and its community. The NOC Chairman also followed up on the progress of the early graduates of the Institute's 46th class. They are currently preparing to apply for the IELTS qualification for admission to a university abroad where they hope to further advance their training in preparation for working life. Dr Ali Dhib thanked the NOC chairman, members of the Board, as well as NOC employees for their enduring support for the Institute and its graduates as they prepare for careers in the oil and gas sector.